When Annelise left for college, it meant good riddance to her abusive father and stepmother—until a bureaucratic screw-up left her without a diploma, flat broke, and facing a future that seemed more elusive than ever. Then she met Ronan—tall, dark, and way too seductive for her own good. He promised Annelise a new life, if she had the courage to chance the unknown. One look at him and she certainly had the desire. Sure enough, accepting rides from strangers does yield surprises. Isle of Night is the premier book in the new young adult series The Watchers. This is a fresh and tantalizing series that anyone from middle school-aged children to adults may enjoy. Due to some more adult issues (maybe a bit scary), we feel that this would not be an appropriate book for elementary school children. The premise feels like Twilight, The Hunger Games, and Vampire Academy all rolled into one. Annelise (usually called Drew) is a teenaged genius who has come from an abusive home and dreams of a better life. However, the old adage of be careful what you wish for… has never more rang more true than in Drew’s case. This world she has now found herself in has only two paths: excel or die. Una and Gikany found Isle of Night to be captivating and enthralling. The story flows easily and the novel is very difficult to put down. Drew is a character that is easy to relate to. She is neither horribly complicated nor annoying (as some young adult heroines can be). It is easy to root for her success. We especially enjoyed that she is not the brawn (like the rest of her classmates/opponents) she is the brains…and the odd duck. It was really entertaining to watch her be pitted against others who seem completely out of her league. It is a very interesting world that Ms. Wolff has created in Isle of Night. The vampire mythology is somewhat traditional even though you know all the myths about vampires can’t be true either. We have a sneaking suspicion that everything at the school is not as it seems. We really enjoyed being thrust into this world along with Drew, learning it as she does. It makes the world building so much more integrated and therefore easier to follow. We eagerly anticipate learning more about The Watchers world. We are anxiously looking forward to the next book in this series! 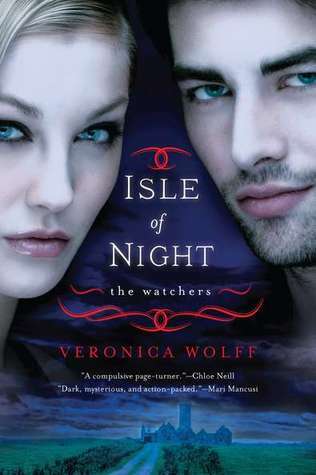 READERS: Come back later today for Twimom’s interview with the author, Veronica Wolff, and a chance to win Isle of Night. Huh, never heard of this one before. Is it me or does that guy on the cover look a lot like the main character from “Entourage”? I’ll keep this book in mind when I’m looking for a new YA series to read. It sounds promising. Thanks for the rec, G and U! Rum – you won’t regret it. Isle of Night is wonderful! Hope you enjoy! A great review! I have been anxiously awaiting this book.